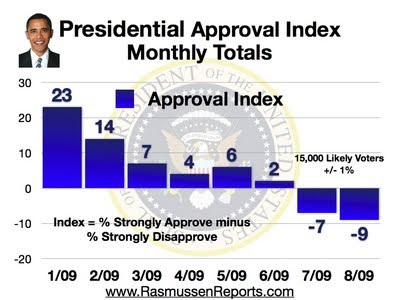 Here we have a graph of Obama's approval rating, courtesy of Rasmussen Polls. 1) He is allowing clearly radical folks to write his proposed legislations for him. 2) He then turns it over to Pelosi and Reid to defend it and sell it. The end result is that these ultra-liberal folks are selling something America doesn't want. They then take cover using tactics that only make them look foolish. 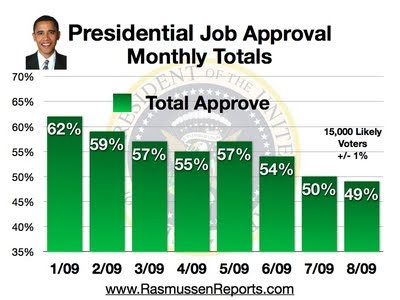 Obama compensates by making speeches that paint him as the guy promising everything to everyone, only to be found out as misrepresenting the truth. He's not selling subsudized housing to welfare recipients on the south side; there is real resistance to his ideas now and people WILL check his words carefully. Therein erodes our trust.